A couple of years ago we sold a computer to an ex-colleague of my wife's, a professor in a school of design and art in Barcelona. At his home, I assisted him in installing and connecting the computer to the Internet, then he had the nice gesture to invite me to lunch. Sitting at the table with his daughter, a young woman in her twenties, they started the chat asking me what I did for a living (Catalans resemble Americans in this.) When I told them I was selling web hosting, the daughter, who explained me she worked as a nurse (noble profession, of course,) started talking scornfully about the Internet boom. I supported her idea saying the Internet is mostly used as a shop window and, appealing to their sense of humor, I added that my wife's web site, being its contents mostly illustrations (she's a graphical designer) has much more success than mine which consists mostly of text; ‘You know, drawings catch your eye,’ said I, a bit cynically. ‘But, drawings are art!’ the father cut me (the “ignorant” silently echoed.) I could have mentioned him that, in my web site, besides of novels and articles, mostly of artistic-philosophical matter, you can enjoy a comic, all authored, edited and published by myself for free, and not because I believe in Ars gratia artis, in fact I've always found this idea repulsive. I didn't because, to tell the truth, neither that nor the more than twenty years I devoted to music make me feel confident about what “art” exactly is. Even so, I'm able to recognize art in selling as well as in this guy's cooking, so I decided to chat less and enjoy the meal. Days ago a friend of mine praised for the umpteenth time my comic strip, something he never did with any of my writings. I don't think to be more eloquent writing than drawing (or composing music, or or farting Morse code.) Besides, my coherence makes me repetitive. Popular knowledge is right in images outsell text. My friend's praise inspired me to draw a new chapter of Gooevo. As I always do, once I finished I showed it to my wife. She didn't understand it. I made a second attempt adding some details to give her some clue. She still didn't get it. Finally I gave up and published it without further modifications. I sent a message to my friend with a link to the freshly published chapter. He didn't get it either. At that point, I remembered an aphorism I had published long ago (number 7) that explains the same idea that I tried to express in the drawing above. I think it's not necessary to carry out a survey to confirm that text offers more guarantee that the message reach the other end. Not in vain ideograms evolved into letters that allow us to build words and then sentences in a grammar capable of representing from the simplest to the most complex idea. Bogrovo: A soldier from the army supporting the democratic president Mazevich gives chocolate to a woman and her daughter among the ruins of their home destroyed by the guerrilla. San Juan de Talpingo: an agent from the anti-narcotics service checks a peasant's identity documents. Many of them use their children to pass drugs hidden in toys. Mahili: To celebrate army day, is an old tradition among women in this small country to give each soldier kaoé tablets, a candy typical from the region, made from puáj seeds. Ginebra: a UNICEF report reveals it's growing around the world the number of cases of sexual abuse to children. In the picture, a woman offers her little daughter to an unknown soldier in exchange for a bit of chocolate. 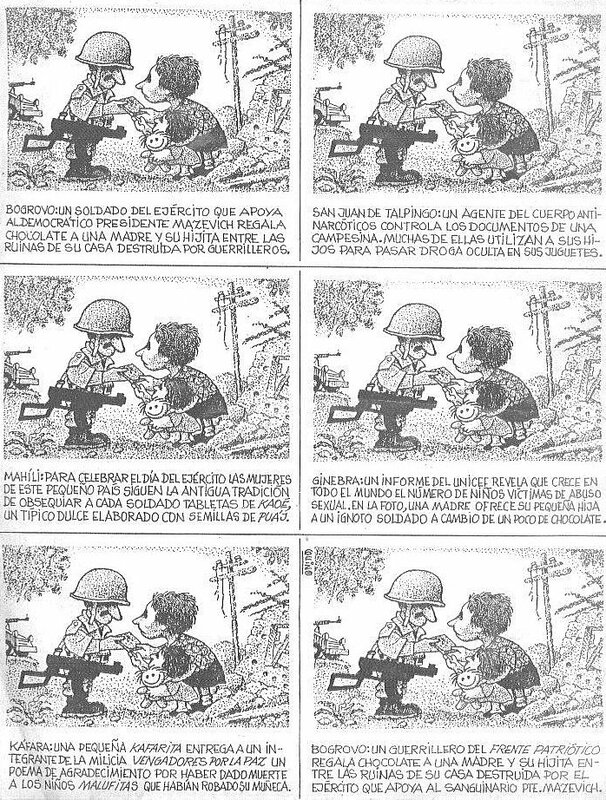 Káfara: A little Kafarite gives a thank-you poem to a “Vengadores por la Paz” militia soldier for killing some Malufite children who had stolen her doll. Bogrovo: A guerrilla from the “patriotic front” gives chocolate to a woman and her daughter among the ruins of their home, destroyed by the army supporting the bloodthirsty president Mazevich. And you, reader, what do you think? Would my comment “drawings catch your eye” upset master Quino?